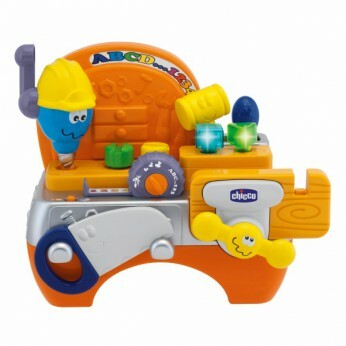 The Chicco Talking Carpenter is an educational toy that helps your child develop language skills in a playful and stimulating way! Workbench full of tools of the trade activities. A vice, tape measure, drill, hammer, screwdriver and saw to help develop hand-eye coordination skills. Talking Carpenter is bilingual: discover new foreign words and phrases in French. A very easy and fun way to become familiar with the different sounds of a foreign language. Learning – 4 songs, Carpenter phrases, numbers, alphabet, shapes, colours, opposites all in both English and French. General information: Batteries required: 3 x AA (included); For ages 1 year and over. EAN: 8033828720241 WARNING(S): Only for domestic use; To be used under the direct supervision of an adult. * 1297733 32.99. This toy costs approximately £22.49 (for the latest and best prices make sure you check our retailer list for the Talking Carpenter above). In our review of Talking Carpenter we classed it as being suitable for ages 1 to 3 years, 3 years, 4 years but recommend you check the manufacturer specific advice before purchasing.